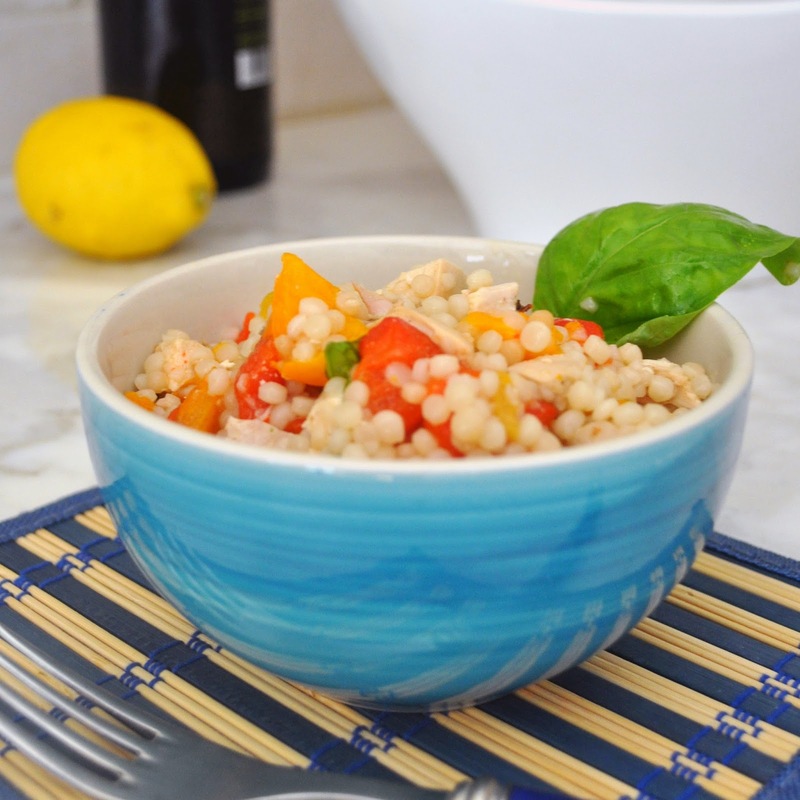 Couscous salad with roasted chicken and deliciously tender, smoky and colorful grilled peppers. Today's recipe is another of my super healthy, picnic dish ideas to make your outdoor meal memorable. Perfect to take along at the park or at the beach, or great idea for your next barbecue or casual party. 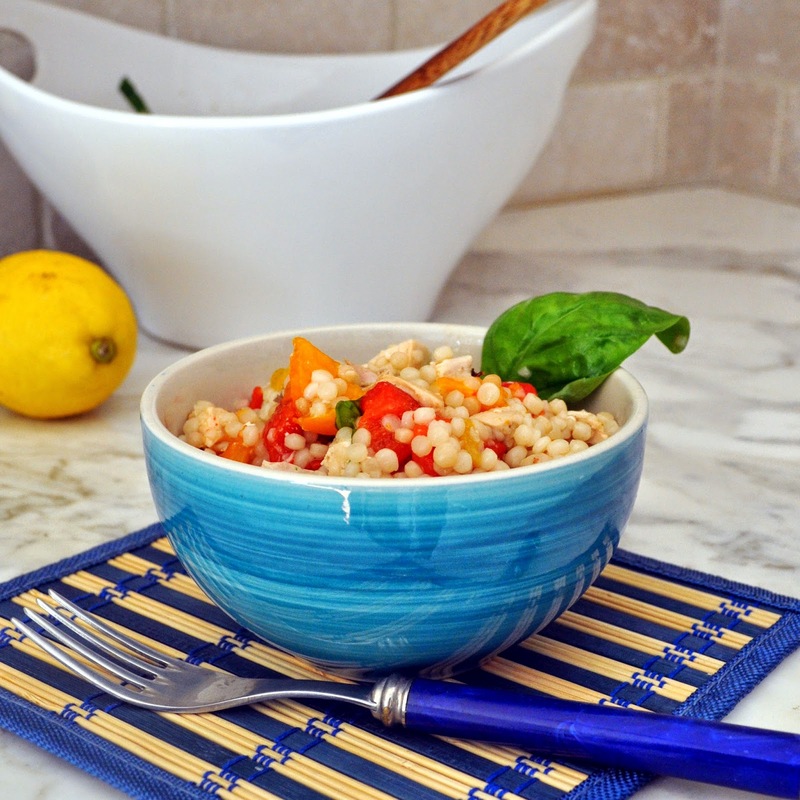 I made this Israeli couscous salad yesterday for lunch for my family day at the beach. It was a huge hit with my husband and the kids! I had some left over roasted chicken from the day before, which wasn't enough for another meal, but plenty to add to the couscous. If you don't have leftover chicken, you can always use a fresh chicken breast, marinate it with rosemary and garlic, cut it thin, and quickly grill it. Just like I did in my couscous salad with chicken and zucchini. Step 1: Preheat the oven to 450 degrees. Roast the peppers by placing them on a baking sheet covered with aluminum foil for easy clean up, in the upper part of the oven. Remember to turn them over every 8 minutes or so. Leave in the oven for about 20 minutes, or until the skin all around is dark and soft. Remove from the oven and wrap the peppers in the foil for 5-10 minutes. This way they become soft and juicy. And easy to peel! Step 2: While the peppers are in the oven, cut the cooked chicken in small cubes. Step 3: Cook the couscous following the direction on the box. I simmered the couscous for about 11 minutes in salted water. Drain the couscous and run it under running water to cool it off. Step 4: Unwrap the peppers, peel them (should be very easy!!) and cut in small cubes. 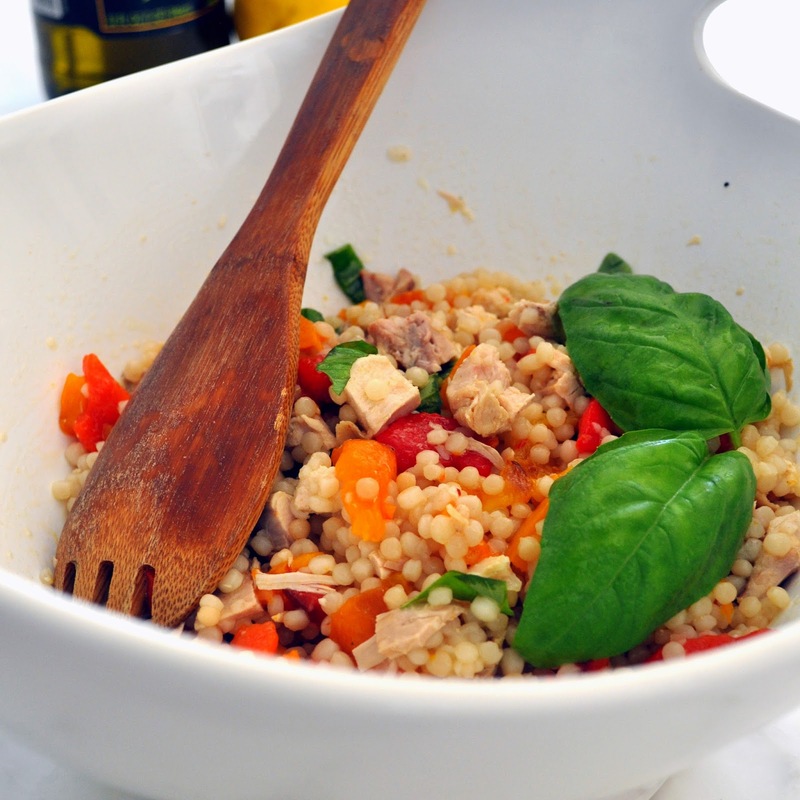 Step 5: In a large bowl, mix together the couscous with the chicken and the peppers. Season with a few tablespoons of olive oil, lemon juice and basil leaves cup in pieces. 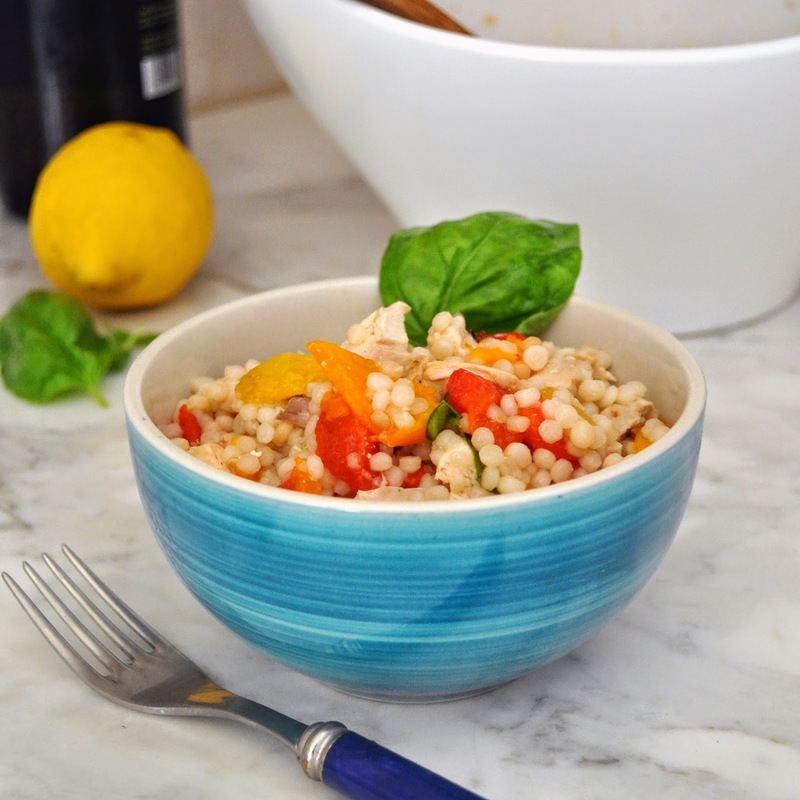 Thanks Manuela - this looks delicious, healthy and easy! I made this for a healthy dinner last night. The textures, colors and flavors are a delight. My husband loved it. 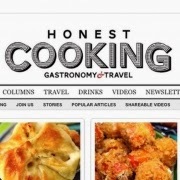 I'm so glad I found your blog...can't wait to try the next recipe. Thank you Manuela! !